One of the most widely produced rifles in America during World War One was the P14 Enfield and the M1917. Designers based these guns on the same prewar British design and they differed in caliber, .303 and 30’06 respectively. But they, along with the 1903 Springfield became the basis for a series of experimental rifles at the Winchester factory. Thomas C. Johnson worked at the center of the project beginning in the summer of 1914. By the end of the war, Johnson built a full range of experimental rifles that led to his post-war designs. 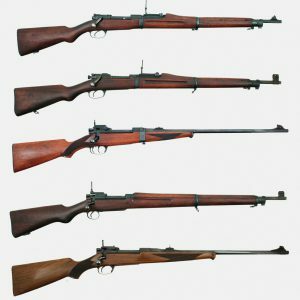 During the war, Winchester still had an eye to commercial designs, and Johnson’s rifles were a mix of military and commercial elements. These prototypes eventually blended features from the 1903 and M1917, but the first of the series, the Model A, bears striking resemblance to the 1903 Springfield. Johnson built a single Model A as a takedown rifle which retained military features like a full stock, handguard and military sights. The Model B also resembles a 1903 and this time Johnson made two. He built the two with takedown stocks and made one in a military configuration and the other with a sporting stock. Two Model Cs were also with takedown stocks, one military, and one sporting. At a glance, the Model C appears more like an M1917 than a 1903, but it isn’t quite a copy of either gun. All of the rifles through the Model C were chambered in 30’06. The Model D returned to its military roots. All outwardly resemble a P14/M1917 action, with some changes, in a military configuration, and none had a takedown stock. Winchester also built more of these than any of the other Models. At least 13 still exist as part of our collection. 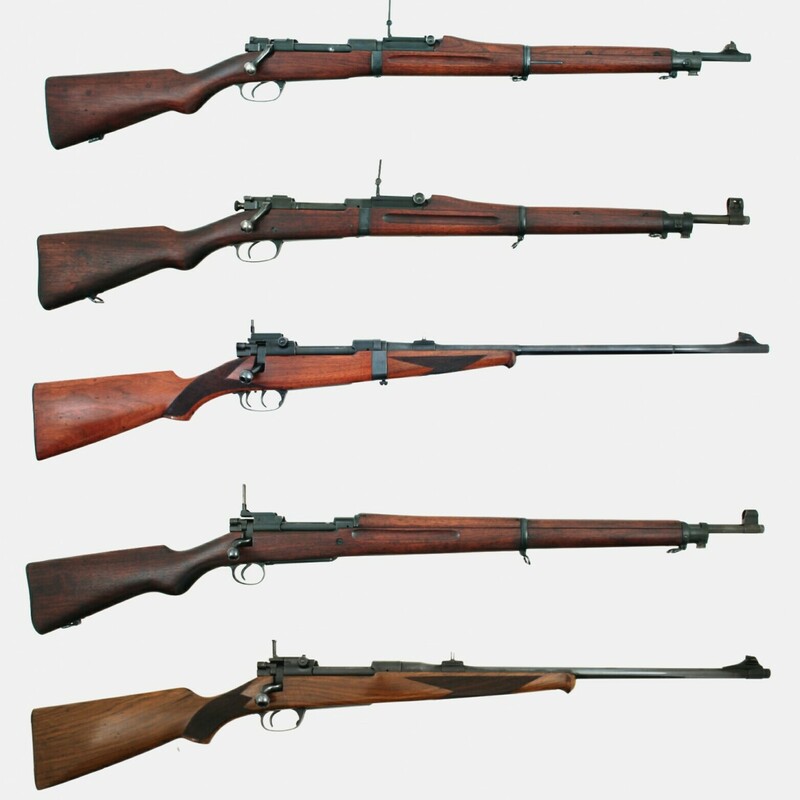 These rifles deviate in caliber and exist in 6.5mm Portuguese, 7mm Mauser, 7.62x54r, and 30’06. We do not know if they ever left the factory, but their caliber and configuration show their intended market. After the Model D, came the Model E. Johnson made at least two of these rifles. The Model E became the short-livedWinchester Model 51, with approximately 20-25 built before production was canceled. We have two Model E’s in our collection, one takedown and one standard chambered for 30’06 and .35 Newton. Johnson’s work continued into the early 1920s. Johnson had a hand in many of Winchester designs from that period including their early semi-auto rifles. And while Winchester never put these prototypes intro production, the company went on to produce the Johnson designed Model 54. Winchester wasn’t the only company to work on a close copy of military bolt actions for the civilian market. Remington adapted their Model 30 from the M1917. But perhaps the true lineage of all these rifles is the Mauser action which had heavily influenced the P14 and been copied for the 1903.